“อุบัติเหตุห้องน้ำ .. เป็นจุดที่พบผู้สูงอายุเสียชีวิตมากที่สุด ฟังแล้วน่าตกใจ ??? เพราะจากตัวเลขทางสถิติปี 2560 พบว่า ผู้สูงอายุ 55 ปีขึ้นไป เสียชีวิตจากอุบัติเหตุ ลื่นหกล้มในห้องน้ำกว่า 1,200 คน/ปี หกล้มจากพื้นต่างระดับมากกว่า 800 คน/ปี เราไม่อยากให้ญาติผู้ใหญ่ของใคร ณ ที่นี้อยู่ในตัวเลขสถิตินี้เลย แนะนำรีบหันมาดูห้องน้ำที่บ้านท่านกันดีกว่า ว่าควรปรับ แก้ไข เพิ่มเติมอะไรบ้าง เพื่อป้องกันอุบัติเหตุไม่ให้เกิดขึ้น หรือเกิดขึ้นน้อยและรุนแรงน้อยที่สุด สำหรับไอเดียการออกแบบควรคำนึงถึงสรีระร่างกายผู้สูงอายุที่เปลี่ยนไป โดยเฉพาะผู้สูงอายุที่ใช้รถเข็น [ Wheelchair ] ดังนั้น การออกแบบต้องคำนึงถึงความสะดวก ปลอดภัย เหมาะสมสำหรับการใช้งาน และสวยควบคู่กันไป ว่าแล้วไปค้นหาคำตอบกันเลย !!!! ราวจับกันตกข้างโถสุขภัณฑ์ ความกว้าง 80 -100 ซม. สูงประมาณ 70 -90 ซม. ควรชิดกำแพง และราวจับกันตกรูปตัว L สูงประมาณ 70 ซม. ‘The accident in Toilet or Restroom is the majority place of Elder Death” We’re shocked, when we knew The Elder Death Static in 2017. We found the elder 55 years more, The number of Elder death reason Ex. Death by Fall down in restroom was 1,200 more Person / Year, Death by Different floor levels was 800 more Person / Year. We never wish any your lovely elders, they will be include in the static. We kindly to recommend, that You should be look back to Re-Design your restroom right now. !!! Which one could be adjust, repair, adding, re-deign in restroom? As the result of There will be the prevent solution for your elders. About The Idea of Elder Restroom Design would be become aware of Elder physical changing, Wheelchair user, therefore The Restroom Design must be considered into Convenience, Safety, Suitable for use, Beautiful. Are you ready?? Let’s go to find out the right answers!!!! Every floor should have toilet, especially locate on 1st floor, Bedroom could be have toilet, or nearly toilet. This will be convenience, safety for your elder in night time. The suitable space of restroom is about 3x3 sq.m. In restroom should have railing many points, tightly installation, flexible size, made by stainless steel pipe size 1.5 – 2 inches. Railing beside of Toilet Bowl : Should be installed both sides, Wide 80 - 100 cm. High 70 - 90 ซม. Pipe size 1.5” – 2”. Must installed Railing on wall in L shape High 70 - 90 ซม. Bath Room Floor could laying by tiled surface, no have reflect, using smaller block tile. And important keep cleaning. Shower area would be have chair, tightly installed, High 45 -60 cm. Floor Laying by rubber mat, floor adjust to smooth, no glitter. The Bathing area : Should be have Safety Glass or Tempered Glass as wall or use rubber curtain. Because of the tempered glass will breaking by pill, and prevent for bumping. Rest room door could be sliding gate, Wide 1 -1.20 เมตร. This have profitable for WheelChair user. Should not have threshold. We recommended coloring could be lower than regularly level 3 – 6 cm. Gate door point have sloping floor. Faucet should be used as lever handle better than spinning knob. Bathroom should be have necessary furnish ex. Toilet bowl, shower cap in Rain Shower style, washbasin, Shelf on wall or tightly installed. As the result of, The shelf might be hit or attack the elder, when they have accident. Bathroom should not be closed, could have Upper and lower vents for airflow, and keep watching elder in emergency situation. Lighting is most important, and could be use eye-comfort lighting. Hope this idea have useful for your lovely elder, while preparing for yourself in future. 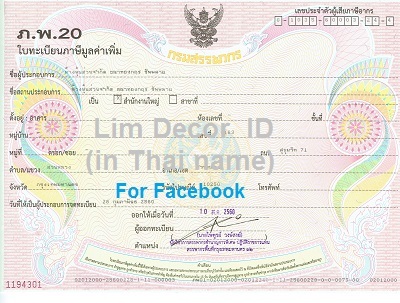 Lim Décor pleased to be warmly consultant, designer, and produce for your demands.